Why Students Drop Out of School? I am strongly believe education is very important for everyone both boys and girls. The number of students that dropout is really high. But there are no recent research to figure out reasons why students dropout. This year I am doing the research about reasons why lower secondary high school students (grades 7-9) drop out of school in Siem Pang district, Steung Treng compared to Phnom Penh, 7 Makara district. 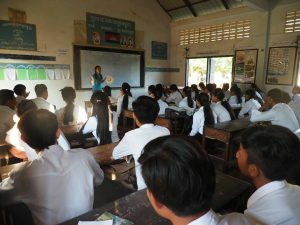 Overall in Cambodia, in 2010, the dropout rate was higher for the lower secondary school (19.6%) than that of the primary school dropout, 8.7%, and upper secondary dropout rate is 11.8% (USAID From The American People). Phnom Penh has the lowest dropout (9.1 percent) and Banteay Meanchey has the highest rate (26.2 percent). I’m going to survey both parents and students that had drop out in one of the districts in Banteay Meanchey and Phnom Penh to compare the differences. One challenge that I’m trying to overcome is to figure out ways I can find people that had dropout to interview. As you know we can’t find students and parents that dropout at school. They might go to other country. 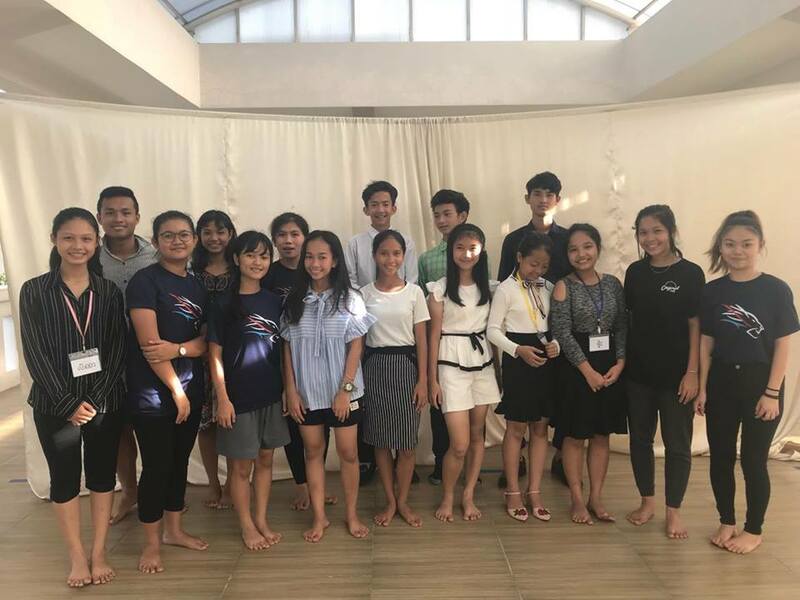 So some solutions I found are to interview those people during Khmer new year (this is the time people gather) and interview people at the factory (there are a lot of workers at the factory which didn’t require any education level). Most of the time in class I worked on the statistic number of how many parents and students I could survey to make a valid data. Also, in order to convey a good survey is the wording of the questions. So most of the time I’m trying to figure out questions I should asks and how to ask the questions (the wording of the questions). Literacy is everywhere. We can learn from everywhere. Even though you’re an adult or children, books can teach you literacy, as well as entertain you as a reader. The British author named Roald Dahl published at least 35 books. One of his books, Charlie and the Great Glass Elevator, was the continuation of the unforgettable Charlie and Chocolate Factory. The book starts with the conclusion of what’s happening to Charlie and the Chocolate Factory in the previous book simultaneously, introduced characters. The whole family came into the Great Glass Elevator for Charlie’s celebration to become the new ownership of the Chocolate Factory. Grandpa Joe is one of the grandparents, he is willing taking part of Charlie and Willy Wonka. adventure. The glass elevator has the special function that nothing can go through it. Moreover, the Great Glass Elevator can bring everyone back into the Chocolate Factory. The adventure to get back into the Chocolate Factory, they have to go up very high until arriving the space. Unfortunately, Charlie’s grandma distracted him, and he did not pull the elevator back in time. This made the Great Glass Elevator get stuck in space, while they are in the space they noticed the Space Hotel “U.S.A” which later got attacked by the evil aliens, the Vermicious Knids. Wonka, Charlie, and Grandpa Joe collaborated to help those people, and finally, they saved the spaceship full of hotel employees commuting there. Again they also find strategies to get back into the Chocolate Factory. At the Chocolate Factory, Willy Wonka offered pills called Wonka-Vite which made the grandparents younger. Regrettably, the grandparents took too many pills and what happens? Roald Dahl created strange and unusual words in this book. Some words do not exist in this world because he created them by himself. For example, Minusland, Gettysburg, cantankerous, snozzwangers, whangdoodles, dumpery, etc. These new words helped Roald Dahl to clearly express each character’s behavior especially with the phrases the characters spoke. Those funny words help people to have fun with reading and it is silly to pronounce those words. The readers not only learning literacy but also learning life’s lessons. The person that have well-being behavior is rewarded, and unacceptable behavior is punished. Charlie is very kind, brave and friendly. Additionally, Charlie would always endure all the trials because of that Charlie inherited the Chocolate Factory upon Wonka’s retirement. Moreover, Grandpa Joe is a pleasing person and worked flexibly hard with his mission especially, when he helped Mr. Wonka to fight against aliens. This is why nothing dangerous occurs to these characters. On the other hand, the other three grandparents of Charlie are disrespectful, annoying, bad-tempered, and nasty. They are unwilling to work or use energy. They always stay on their bed (never want to get out). Most of the time they always have negative thoughts and act too headstrong. This is why throughout the book they always face hazardous situations. For instance, all of them selfishly took pills called Wonka-Vite from Willy Wonka to reduce age. Unfortunately, because of their egocentric nature, two of the grandparents became a 1-year-old baby. Another grandparent was minus age which made her disappear from this world and send to the Minusland. Roald Dahl not only intentionally teaches the readers life lessons, but teaches us through settings as well. Charlie and the Great Glass Elevator include the Space Hotel “U.S.A” and the Great Glass Elevator. The author tried to explain to the readers that current technology is rapidly developing. Inside Space Hotel there was a swimming pool, fancy bedrooms, dining rooms, gymnasium, etc. Also, the Great Glass Elevator can be able to travel to the space, which currently there are inventions that make people can travel into the space safely. The Great Glass Elevator serves two target audiences: there are adults and children. Roald Dahl used strange worlds throughout the book, including aliens as the characters, and adding politicians in the book. Additionally, he used different types of people: lazy people, coward people, genius people, and hard working people. In order to make this book convincing and entertaining he used funny phrases as well. For example, Willy Wonka expressed, “We have so much time and so little to do! No! Wait! Strike that! Reverse it!”. Personally, I recommend everyone to read Roald Dahl books because you can entertain yourself and learn life lessons at the same time! The last two year at Liger Leadership Academy before graduated, we all need to finish a research paper. 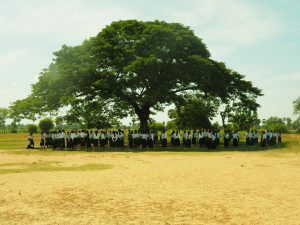 In Cambodia, dropout is a widespread and common problem. The dropout rates are especially high in rural areas due to intensified economic pressures on the family and a lack of formal higher educational opportunities. The number of children involved in work is really high. By going to work, kids are denied from school because of their family finance or education. So, the kids can help them with their business at a young age (ILO Unicef). It stretched out to both rural and urban schools regardless of if the students are girls or boys (KOICA). As with the dropout rates, rural communities are not as successful in retaining students as urban communities. School dropout can be due to social and academic problems in school. Lastly, students are lacked of support and resources from their families, schools, and communities. Researcher in Cambodia mentioned before students drop out these were the symptoms irregular attendances and completed fewer assigned homework. The students’ parents divorced or passed a ways they are most like to quit school very fast. Parent level of education also might effects their children attended school according to their wealth and the education’s level. Also, Cambodian students helped their parent to do house chores and work. In Cambodia, there have been few studies conducted on school dropout rates and rationale. Additionally, these studies only focused on select provinces in Cambodia. The studies were from 2010 to 2016, and the statistics show that the percentage of student dropouts remain the same, that means the problems researcher’s found haven’t fully solved yet. Since the information was years ago, it won’t be valid anymore to represent the new generation. Currently, the dropping out is still a problem that needs to solve. My research will be the next research paper that focuses on two areas in Siem Pang and Phnom Penh of why students drop out in 2019 (identify the differences). The information will help to reduce the amount of dropout in Cambodia currently. The Phnom Penh Post stated, “The Kampuchean Action for Primary Education’s (Kape) school dropout pilot program currently operates in six provinces – Battambang, Banteay Meanchey, Pursat, Kampong Speu, Prey Veng and Svay Rieng”. My research is different from other researches because there has been no study conducted in Stung Treng regarding student dropout yet. Moreover, this research will reduce the rate of the dropout in Stung Treng because more people will notice Stung Treng and realize that it needs help to solve this issue. Even though, my research focuses only on a small area, I will try my best to make the data as precise and accurate as possible. The information will be from students who dropped out and their parents. The information will help school availability reduces children’s work involved and increases enrolment; school quality helps working children to remain in school. Most importantly, to compare the changes of reasons why students drop out from eight years and two years ago to now. It’s a sign for everyone to do something to reduce or retain of students that drop out. In 1999, more than 96% of primary enrolment in Cambodia has increased, the retention helps by providing breakfast to the students. Most of the students have to choose to attend school or help their family (World Food Programme, 1999). I will survey by interviewing. The survey will focus only on the students that drop out of high school and their parents. The survey will focus only on the students and parents of the drop out high school; both of these parties will receive separate questionnaires. This research will begin next year: 2019. Basically, this second term of exploration in research we focused on writing our research proposal to the school so we can get the fund and the agreement to start our research idea. One of my dream in the future is to be the screenwriter so why not start it now? 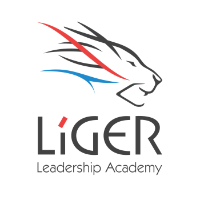 In Liger Leadership Academy I got an amazing opportunity to be a part of the traveling theater group. Create a Traveling Liger Community Theatre troupe which would include a variety of performances written and performed by Liger students that have social impact on Cambodian culture. This could include short plays around meaningful topics such as healthy habits, sanitation, etc. Musical and other creative performances would be developed. The portable set and cast would perform perhaps one weekend a month in different rural villages with performances lasting 1 to 2 hours. Last round we focused on writing our own play which our main theme is a healthy relationship. This round is the opposite our main focus is actually doing the play that we collaboratively wrote it. 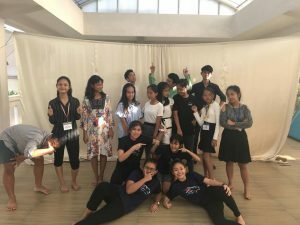 The play was around the goal who judged by the society because of how she looked. There are two spirits, one is beautiful and slim, another is overweight, buy eat whatever she wants. Then she realized no matter how she looked she’s still judged by the society anyways. Just be who you are and be yourself. I am one of the actors. I represented the beautiful spirit. 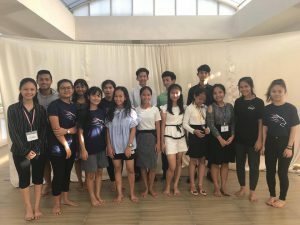 On Wednesday, 12, 2018 we performed our first play to Liger students; this play was organized by the students in the group: the stage, costumes, acting, and screenplay. We got a lot of excellent comments which encourage us to push ourselves harder in the future when we perform to the local audiences. This term we’re seriously planning for the workshop with the students. Our first experimental workshop was working with students at the Dey Dos high school in Ta Kmao. This was a very successful workshop and we believe these workshop should be distributed to the students in the provinces. What worked best during the workshop is that the two teams complete their film very quickly. This is the experimental team where it is close to our school. We have some feedback, and problems we can improve later in the future for the workshop in the provinces. We need to push the students to write the script because it will be more professional and that’s the reality. Maybe next time give them the specific theme, so they have a more specific idea of what to write. Also, we need to give a specific timing to them so can be on time. We really need to have a better communication with the director. Most importantly ask the students how can we improve and how can they improve at the end of the workshop. ILO stands for International Labour Organization. In this exploration, we collaborate with ILO to facilitate soft skills training. Basically, students read and understood one or two skill-building modules, created by the ILO – a UN agency – specifically for corporate-level training. 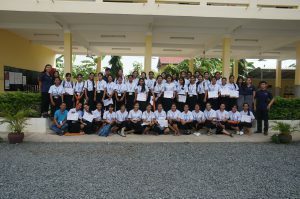 Students then offered these training modules to high schools/universities in Cambodia, monitoring as other students engaged in the self-guided modules. Before you lead others, first lead yourself, lastly together lead for results. 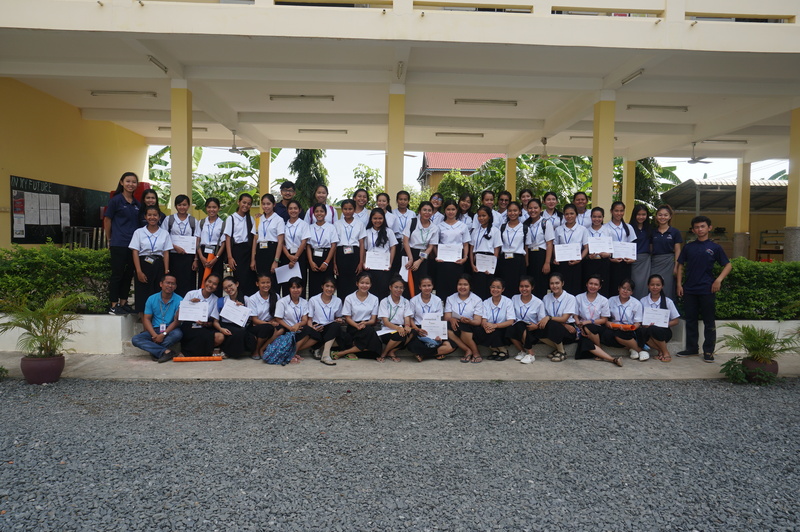 On Friday, International Labour Organisation Collaboration team went to Happy Chandara School to offer the “leadership” soft skill training modules in Khmer (we translated the module ourselves) because our main target audiences are high schools/universities in Cambodia. We were there to mentor and answer questions but mainly this training is students engaged in the self-guided (in teams). 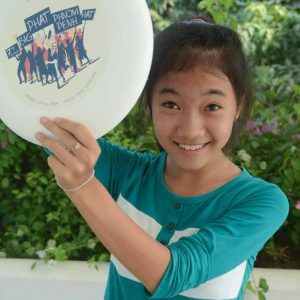 Frisbee League Pioneer is to create the first Cambodian frisbee league that is replicable and scalable, enabling empowerment of rural girls in Cambodia, challenging female stereotyping, through facilitation of a more gender-equitable environment. 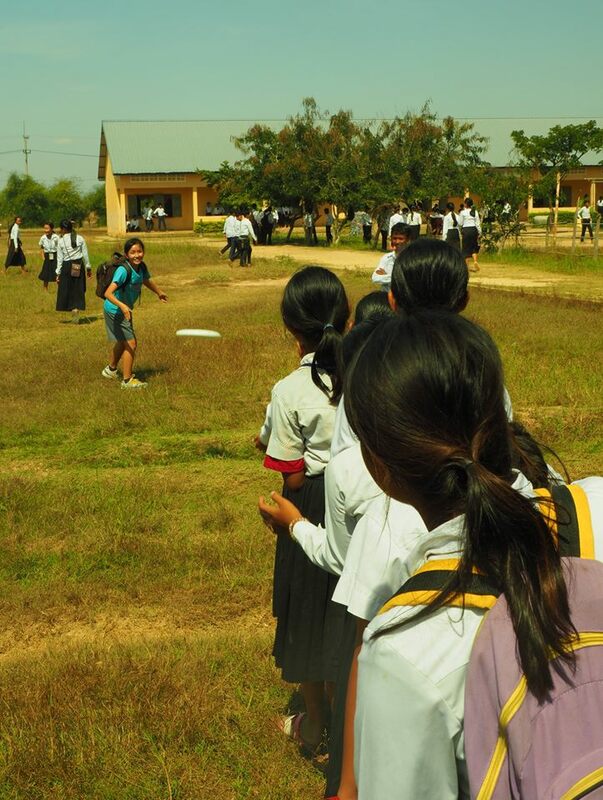 Gender inequality affects many facets of society: business, education, and sports; Cambodia is no exception. Many Cambodians, not unlike others, have developed a mindset against girls playing sports. However, contemporary society is deconstructing these stereotypes by embracing girls in the sports field. With 65% of the whole population being under the age of 30, it is crucial to educate and empower the youth of today to support youth of the future. Achieving gender equity has been, and is still, a struggle the world tries to overcome; it’s also listed as the fifth Sustainable Development Goal (SDGs) to be achieved by 2030, by the United Nations Development Programme (UNDP). Although the goal is set to be attained in 12 years time, it’s never too early to start taking action now. Our pilot project is designed to address this goal. We envision that our league will impact a wide range of communities listed underneath Community-Based Development. With a valid measurement and proof of the shift in opinions on girls’ enrollments in sports, we might present a White Paper to the Ministry of Education, Youth, and Sports and possibly establish a female sports policy. Introducing frisbee is merely our entry point, rather, equity and female empowerment is our end goal. On Thursday, 6, 2018, early morning, nine of our of us in this exploration traveled to these schools to run initial frisbee sessions and gauge interest among the girls for the league. We have about thirty minutes with the girls to convince and throw frisbee around with them. We were blown away by the results. They loved playing frisbee. A few voluntarily came back for the afternoon session after school to play more. Some said they had never played sport before, because of social or family pressure. All in all, 266 girls indicated today that they were keen to join the league. Additionally, on Wednesday this week, we went to the four schools again to do our official pitch to the girls that were interested. We wrote down all of their names and around 200 hundred students are still interested. This means we really more discs before January when we start our training sections with the girls. We are all really proud of our solid work so and we’ll continue to push ourselves to work harder. Most important we need to find sponsors before the training starts. The first round we did research about the healthy relationship then we design the workshop for teenagers. This round we distributed the workshop to Liger Juniors and Seniors. At the sharation we discuss gender based violence. This a tough topic to discuss, but this is a very important topic. Gender-based violence is mostly violence against women. Why only women? One reason why is that the society had taught boys and girls differently when they’re born. Actually, we are all born to be the same. Boys taught to watch violence cartoon and girls taught to play with Barbie. This is why men are more violent than women. Another topic that we brought up is consent, watch our video below for more information. We entered this video into the Gender-Based Violence competition (November is a gender-based violence day) and we won first place. The statistic is a very new and complex topic that we start to study this school year. Our unit 3 topic mainly about scatterplot, response and explanatory variables, linearity, correlation, associations, and their summaries, R and R-Squared, residuals, least square regression lines, outliers and influential points on a scatterplot, transformations (minor topic), reading computer outputs and how to use functions in the calculator. When we studied scatterplot I have a hard time of how to interpret the slope because if we missed said of any important words everything is going to mess up. My math teacher, Jeff, say my name in class to identify the slope then interpret the slope. I was so shocked and nervous because I have no idea what to explain, and every word I have in my head kind of mess up. The words that I always keep in mind: explanatory, response, predicted, changing Y over changing X. When I started to interpret the slope, it wasn’t correct. But does it stopped me? I know for sure I need to work two times harder than my fellow classmate of how to be confident of how to interpret the slope. Outside of class time after lunch, I came to ask my teacher to explain deeper and another way that I can understand it better. It took him only 15 minutes to explain. I took all the note and try to remember clearly of how to interpret the slope. From that time on whenever there is a question to interpret the slope, Jeff would call out my name and complete the question. Before our Christmas break, we took the test and finally I interpret slope correctly. In chemistry class, we’re not only learned formulas and labs. We also did some research that university students are learning. 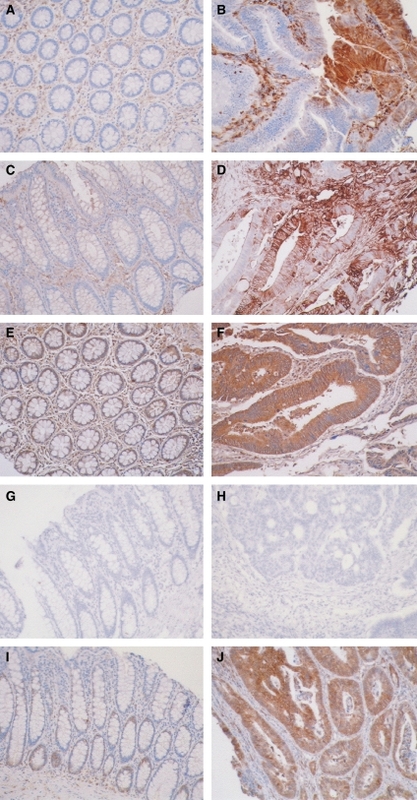 We looked at the figure about normal, colorectal tumor, and colorectal cancer cells analyzed for intensity of annexin protein staining. 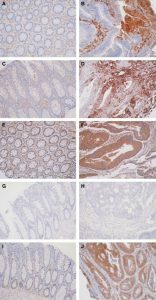 Also, we looked at the picture figure about panels A, C, E, G, and I (left) are normal tissue, Panels B, D, F, H, and J (right) are colorectal cancer tissues. A and B show annexin A1, C and D show annexin A2, E and F show annexin A4, G and H = annexin A7, and I and J = annexin A11. What we learned from our background and research information is that MMP (Matrix metalloproteinase) is a group of enzymes that create a microenvironment for cancer cells to grow and break down ECM (Extracellular Matrix). In order for those tumor cells to grow, they need nutrient, so MMPs also help to increase blood vessels for the nutrient to flow through the blood vessel. These enzymes are able to control annexin, which are proteins that can be found in eukaryotic organisms; from that conclusion, there’s an evidence that it is possible for the annexin to grow in tumor cells. Our we conclude this is that tumor cells have more annexin than normal cells. 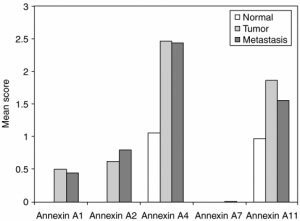 The amount of annexin A4 and A11 in the tumor cells are almost twice as much as the normal cells. Annexin A4 has the most protein present in both types of cells. However, there is no Annexin A7 in both types of cells. We understand more about science literature especially interpret the figure by ourselves, and predict what are the scientists’ prediction or what are their results for the experiment.